Longsol is a leading owner and operator of utility-scale solar (PV) plants. We have unique expertise since 2006 in acquiring and managing solar plants across multiple jurisdictions, under long-term power purchase agreements with state utilities, as well as with Feed-in tariff regulations. The facilities are located in Western Europe and North America – our current portfolio includes 7 solar PV plants with an installed capacity of 80MW, in the U.S., France and Spain. 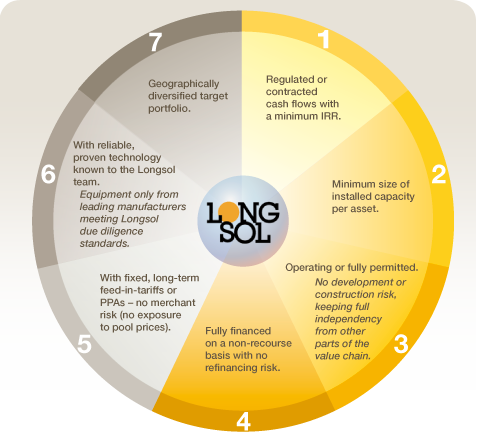 Longsol offers a unique investment opportunity in the fastest growing source of energy generation (including both renewable and conventional energies). Since 2006, the Longsol management team has led the investment of more than 600m Euros in solar PV assets.